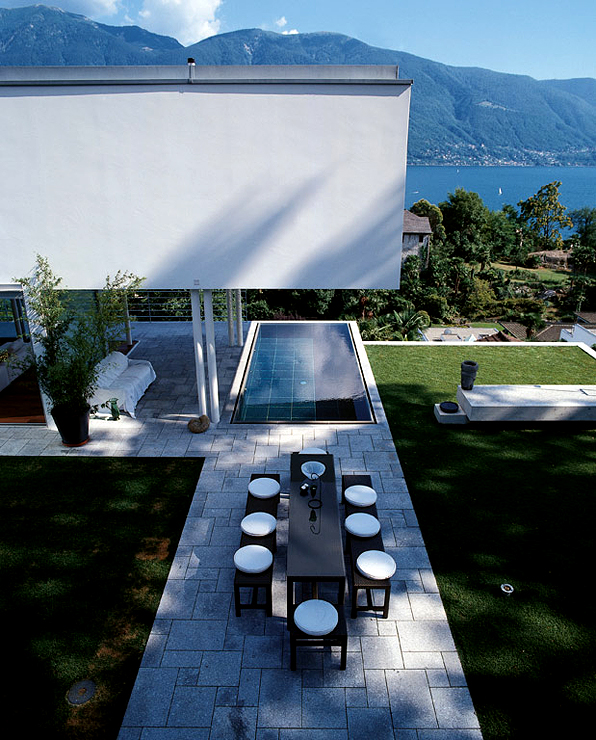 In 2002, Swiss architects Stefano Foni Gueli and Fausto began the construction of cubic villa on Lake Maggiore. The concrete villa was completed by 2003. 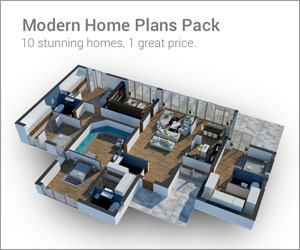 Its flat roof and glass façade combined with concrete construction unite the best of classical modernism in an intricate U-shaped floor plan design. From a side, the building appears as two different buildings connected by a glazed entrance hall which serves as a link between the east and the west wings. 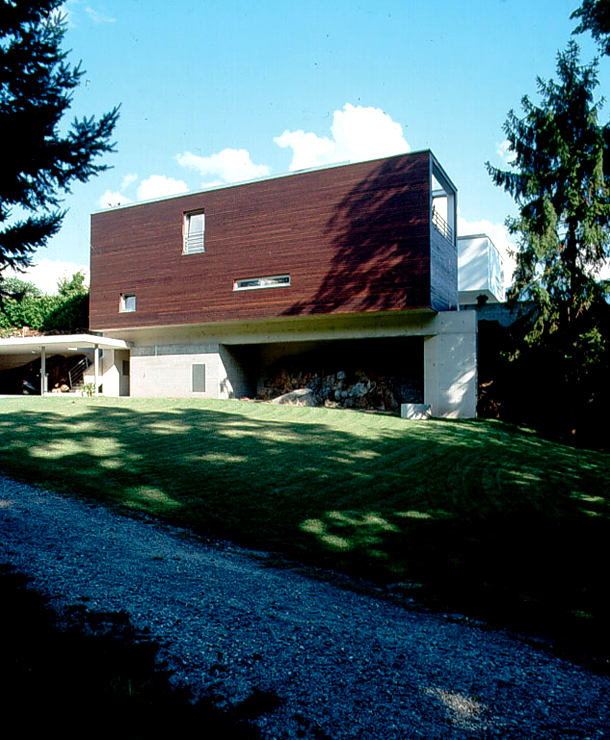 The east, â€œpublicâ€, side of the building is plastered bright white and transparent; it overlooks the harbor in Ascona, while the â€œprivateâ€ southwest side opens to the garden and small forest. 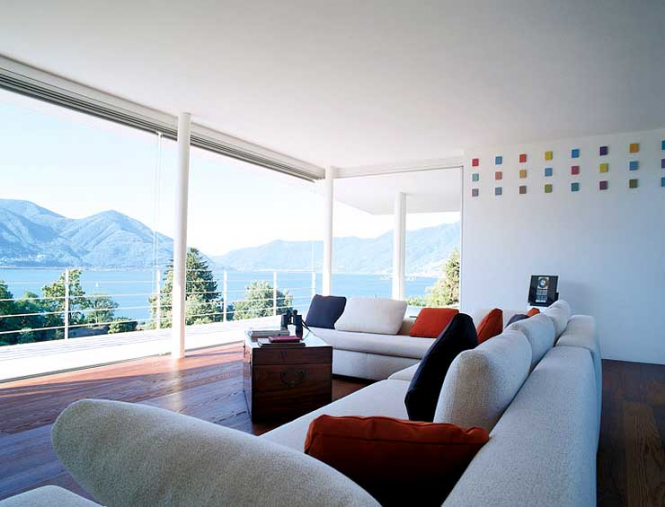 While the metal and concrete materials of the building add an industrial quality to the villa, the wooden interiors serve as a transition to the spectacular views of the countryside, Lake Maggiore and the Swiss Alps. 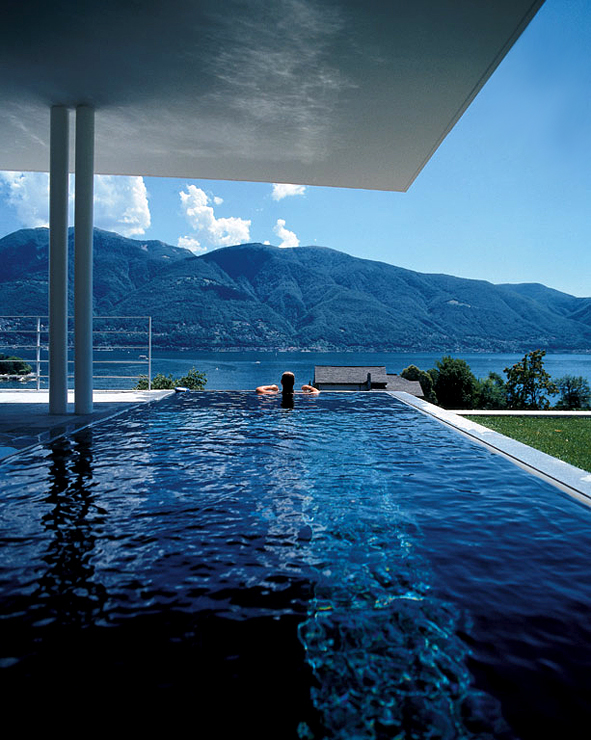 The east wing of the building extends as an overhang above dark granite tiled pool with shimmering water and a spectacular view of the Swiss Alps and deep blue waters of Lake Maggiore. 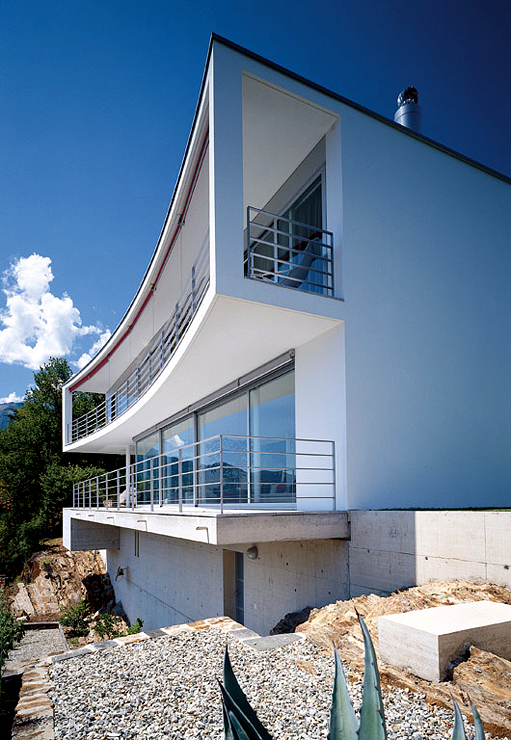 The overhanging roof of the villa also protects it from strong sunlight. 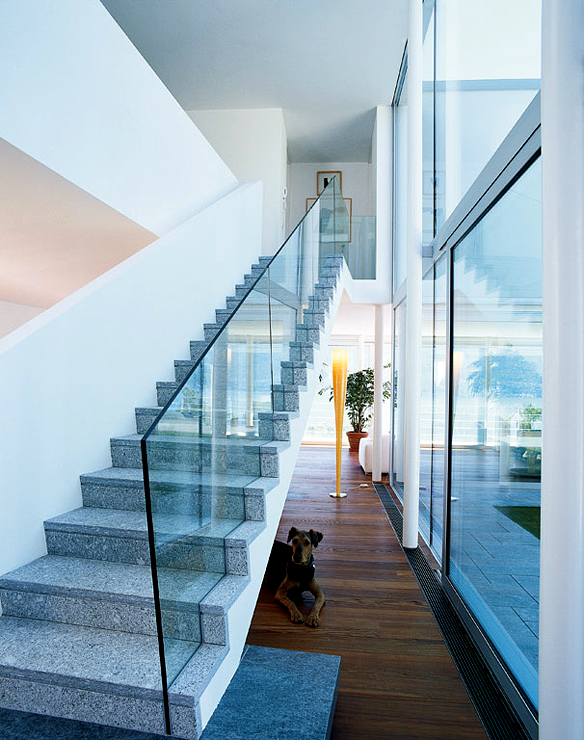 The steel entry door leads to the central hall of the house where the staircase with glass banisters is located. 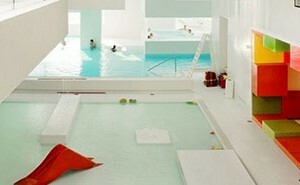 Oiled ash hardwood flooring throughout the house, provide the feeling of comfort. Kitchen and dinning area are located on the first floor of the west â€œwoodenâ€ wing of the house, with a nursery room upstairs. Office is located on the second floor near the staircase. 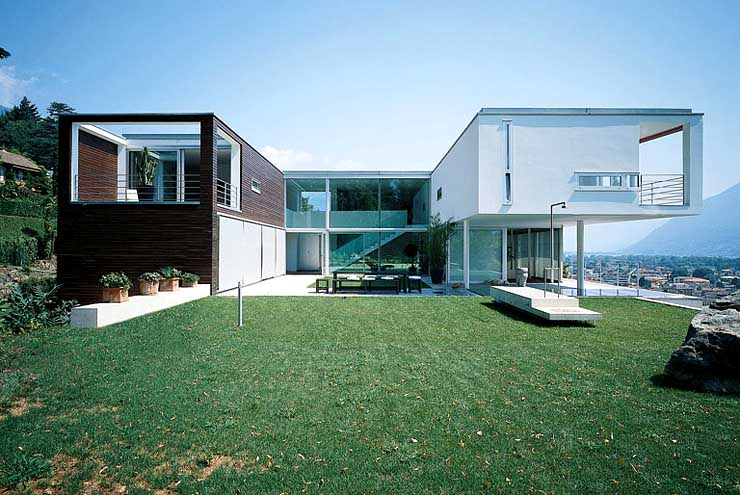 First and second floors of the east wing include the parents’ bedroom with its own panoramic terrace, bathroom, nursery, and the large living room with floor to ceiling glass windows overlooking the lake panorama and a private terrace.